What If Maybach Made A City Car? Combine a Maybach with a Smart car and you get the poshest city car ever. 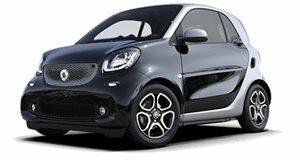 When you think of the Smart ForTwo you think of it as an unassuming civilized city car, but that hasn’t stopped attempts to spice it up – some more successfully than others. The Brabus Ultimate 125 looked like a Smart car on steroids, but branding the tuning job as a “supercar” was perhaps a stretch too far considering it only had a modest 125-horsepower. One rendering artist even tried to turn the Smart into a compact supercar by meshing the ForTwo with the front of a Bugatti Veyron. The result was rather disturbing, to say the least. This latest effort comes from talented render artist Jan Piesert who has slightly more realistic aspirations, visioning what a Maybach would look like if it was condensed into a compact city car. Inspired by the electric Aston Martin Cygate using two electric motors to power the rear wheels, Piesert used the Brabus Smart Fortwo as a base and made some alterations to the front, rear and interior to create the lavish city car. The front grill and lights were inspired by the Maybach 6 Concept, while the large 22-inch wheels are taken from a Maybach S 650 Convertible. The rear has been redesigned to incorporate a full width LED light bar, while weight-saving carbon fiber panels adorn the sides and roof. Of course, if you’re wealthy enough to own a Maybach you don’t buy one to drive, you buy it to be driven around by a chauffeur. Maybach’s S-Class and G-Class are known to have some of the plushest and most spacious interiors in the industry, which you wouldn’t think would translate well to the confines of a Smart car. And yet Piesert has done a masterful job merging the intricate interior from a 2018 Mercedes-Maybach S-Class into the Smart Fortwo’s cabin. The level of craftsmanship you expect from a Maybach hasn’t been compromised, from the wood grain dash, to the quilted leather seats. The result is undoubtedly the poshest city car we've ever seen - or at least it would be if it was real. While merging a mammoth Maybach with a Smart Fortwo may look ridiculous, the idea isn’t too far-fetched. As cities become increasingly congested, Piesert suggests there could be demand for a Maybach for the megacity that would appeal to drivers looking for a luxurious and technically advanced compact city car. Just don't expect it to be cheap compared to the competition.